What’s a photo of John Wayne doing in a Cookie recipe? Hang on. Is that Jimmy Stewart there too? And Lee Marvin? Yes. Yes that’s who’s in that photo. And trust me on this, it ALL relates to cookies, me, and the books I write. I mention John Wayne in A Basic Renovation. John Tilbook in For Your Eyes Only holds a special place in his heart for Jimmy Stewart. 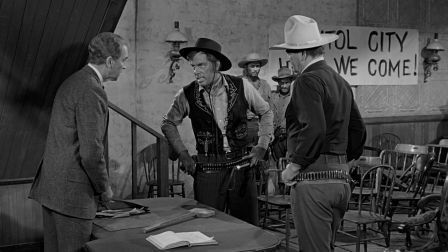 I use the word ‘dude’ a lot in real life, and Lee Marvin calls everyone ‘dude’ in The Man Who Shot Liberty Valance, which is known for the line “This is the West, sir. When the legend becomes fact, print the legend.“ You see where I’m going with this yet? There’s a legend about cookies, Kids! You’ve probably heard it. It’s about a cookie recipe someone bought ‘for two-fifty’ from Nieman Marcus (they have the story on their website), a department store that supposedly sold the cookies in their store cafe. The tale gooes something like this: Upmarket Department store patron, Mrs Ima Kuucky thought the cookie she had as a dessert after her lunch was so fab she asked for the recipe. The waitress told her it would cost ‘two-fifty’. Ima put the two-fifty cookie recipe on her credit card, along with the lunch she had, only to discover a month later that the ‘two-fifty wasn’t two dollars and fifty cents, it was two hundred and fifty dollars. So the Ima was so shocked she’d misunderstood the difference between ‘two-decimal point-fifty’ and ‘two fifty’ and complained to the store, which told her to pay up because that was the way the two-hundred-and-fifty-dollar cookie crumbled. This turned her shock to a need to seek vengeance. Ima decided to ‘share’ the store’s cookie recipe with the universe. The Legend is born. When the legend becomes fact, print the legend. I’d serve this legend with coffee. Cream butter and sugars until fluffy. Add vanilla and eggs; beat until combined. Add oatmeal, flour, baking powder, baking soda, and salt; mix until combined. Stir in chocolate chips, walnuts, and chocolate. Roll dough into 1 inch balls and place 2 inches apart on large lightly greased baking sheet. Bake 10 – 12 minutes or until light golden and still soft in the middle. Transfer cookies to a wire rack and cool. Serve with a giant-assed pot of coffee. Nominomness: I would so pay $2.50 for this cookie.